Well, what can I say apart from Guido absolutely rocked my dad's surprise birthday party. I haven't seen Guido singing in over 20 years (my family used to watch him back in South Africa) and I got extremely excited to find out he was here in the UK and available to play at my dad's birthday. Guido remembered my family from all those years ago and we all had the most incredible night. Guido took requests and wasn't too put off when I tried to share his microphone at one point..haha. My daughter has already book Guido for her 18th birthday bash next year, which she arranged directly with him on the night So looking forward to seeing him again for more celebrations. Thank you for an amazing night. Thank you so much Guido for helping to make Georgia and Alex's reception such a success ! The background music and singing during drinks and meal was so good some people thought it was a cd. Later on your dj-ing and band the T100s kept the dancefloor packed all night and everyone has commented on how good the music was . We very much hope we get an excuse to book you again for another celebration soon . Guido contributed greatly to the success of our Pre Wedding Celebration Party. His music and singing were wonderful. All our guests said, and wrote to us, how much they enjoyed the easy listening, happy, music. We were able to talk with each other over the music and this added greatly to the enjoyment of the evening. He is talented and empathetic to the situation and chooses songs accordingly upping or slowing the tempo as needed. 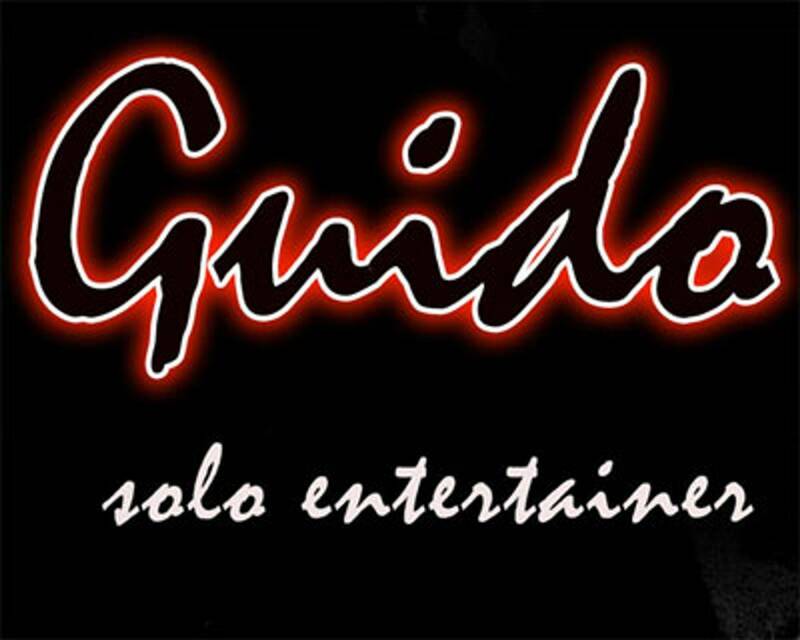 My husband and I would highly recommend Guido if you need something, or someone special to entertain you. Thank you Guido. Had a good night in the raven/piano bar last night. Thanks Guido good all round entertainment. David and Jean. I was at school with you in Krugersdorp (remember the song we wrote for the KHS 75th anniversary??????) and remember you not only as a gifted musician and singer but also as a fabulous artist (sketching, painting, etc). Curious to know - did you ever do anything further with this other talent? From the comments below and rave reviews on other sites, it's great to see that you've gone from strength to strength in the musical field. Congrats! Guido, you were a star for Gray's 50th. The songs were spot on, your special 'room reading' skills enabled us to totally relax knowing you had the music sorted... some nice touches and special requests combined with overall consumate professionalism and a real warmth. You made the night for us and I can totally recommend you. See you at the next event! Guido made a potentially good evening into a great one. A consumate professional, it was an absolute delight to have Guido playing at our end of season social and he pitched every song he played absolutely perfectly. Thank you for all your exceptionally hard work and patience. Thank you so much for playing at my husband's surprise 60th birthday party last week! We all had a wonderful time and your singing definitely added to the festive atmosphere. Lots of our guests remarked on how much they enjoyed your musical style and it was just right for the occasion. Thanks so much for making Lindas 60th bithday party go with a swing. You picked perfect songs for the occasion - all sung & performed brilliantly - unlike most of our fun karapke attempts! Everybody commented on the music and had a great afternoon. Thanks again & we'll recommend you to all our friends. I have never before been to a wedding where the entire room got up to dance, but this is exactly what happened at OUR wedding, thanks to Guido! His range of songs was incredible, and there was definitely something in there for everyone (we loved the Greek dancing!). We would certainly recommend hiring Guido for a party! Guido DJ'd at my 21st party at which there were lots of my friends but also family. Everyone loved the music and was up dancing! Guido was very good and encouraged people's requests which he played almost straight away to everyone's delight! Everyone had a super time! Thank you very much! Great to see you again Guido! Soooo pleased you were in the right country at the time of my party, well, actually I made sure you were free before booking the hall and deciding on any thing else! Brilliant, fun party and I loved it that everyone.....from 10-75 yrs. old were dancing, also that you took into account some of MY favourite songs! Excellent job, many thanks again Guido! Thank you, Guido, for putting on a great show for our party. All of the guests loved the music. We could not have been more impressed. You made our night.